There are always a few things in your house that you just can’t get rid of no matter how hard you try. However, as your family grows, more and more people in your house will feel the same why, which could lead to a mountain of clutter scattered all around your home. This will drive most people crazy as they just try to navigate around their home on a daily basis, but no matter what you do it always seems that more and more stuff seems to find its way into your house. In today’s blog, Just Store It!, the best storage facility in Johnson City, will go over a few ways you could get rid of that clutter in your home once and for all. There’s nothing quite like a garage sale to help get rid of that stuff you don’t need or want anymore. Not only are garage sales a great way to get rid of that stuff that’s been locked up in your basement, closet, or garage for years, but they’re a great way to meet neighbors and other people who live in your neighborhood. On top of that, you also get paid to get rid of the stuff you don’t want in your house anymore, that’s we call a major win-win situation. Go through the possessions you no longer want, come up with a fair price for them, and set them on your lawn or driveway. Go around to the rest of your family and see if they have anything they wouldn’t mind parting with. Don’t forget to put up “Garage Sale” signs so people know that you’re selling things and not just showing everyone your cool stuff. Everyone has that wardrobe they haven’t worn since 2002, or maybe that hefty wooden entertainment center you bought at your neighbor’s garage sale has overstayed its welcome in your basement. If you have stuff you don’t want anymore but don’t want to throw a garage sale to get rid of it, then donating it is your next best option. Find your nearest donation center, pack all your stuff up, and take it over to be donated. There are even some stores that will pay you to take in your gently used clothes and accessories. Not only are you getting rid of the stuff you no longer want, but you’re giving others an opportunity to have something they’ve never had or had very little of. You’ll feel great every time you drop off your stuff at your local donation center. We get it, sometimes you just can’t part with your stuff, or maybe you don’t have enough room in your home for everything. Whatever the reason is, if you don’t want to part with your stuff, then a secure storage device is your best bet to declutter your home. Choose one that’s close to your home and has enough storage space for your stuff. Amenities like 24 hour security camera protection and gated entry help keep your stuff safe and secure every hour of the day. 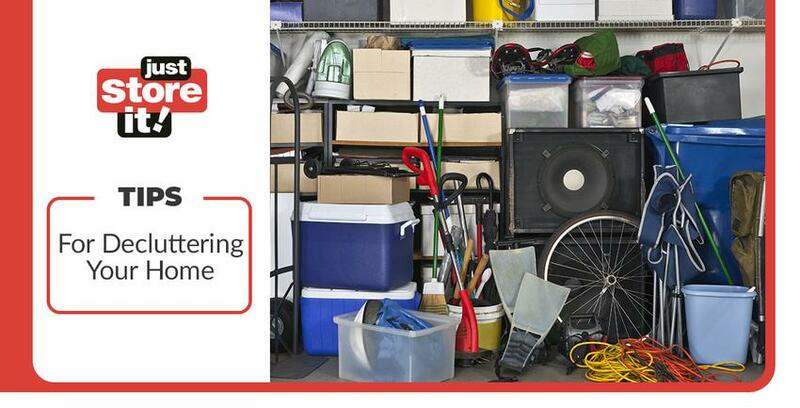 Get that clutter out of your home and into a storage unit. If you’re looking for the best storage units in Johnson City, then Just Store It! is perfect for you. See what kind of amenities we can offer at our Johnson City storage facility, learn more about Just Store It!, or contact us today to answer any questions you may have.